KANSAS CITY, Mo. 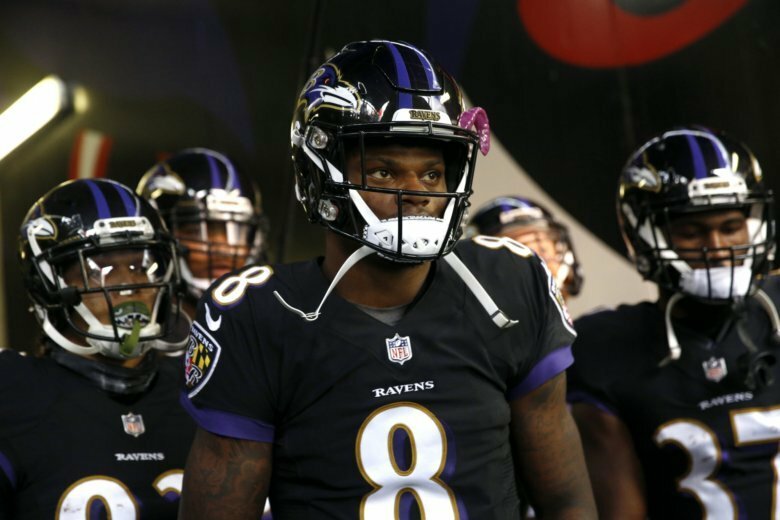 (AP) — Lamar Jackson knows that he will play a big part in stopping the high-flying Kansas City Chiefs offense when he leads the Baltimore Ravens into Arrowhead Stadium on Sunday. He won’t make a tackle, though, or cause a fumble or intercept a pass. That’s because stopping Patrick Mahomes and Co. begins with keeping them on the sideline. And to do that, the Ravens quarterback needs to make sure he keeps his own offense on the field. The Ravens have been good at that all season. Even before Jackson took over for Joe Flacco, who remained limited in practice this week with a hip injury, the Ravens employed a ball-control style offense. Their average time of possession is nearly 32 minutes a game, third-best in the NFL, and that in turn has helped Baltimore lead the NFL in scoring defense. It has been even more pronounced after Jackson went under center, though. He has 265 yards rushing to set a quarterback record for a player’s first three starts in the Super Bowl era, and the Ravens have run for at least 200 yards as a team in each game during the corresponding three-game win streak — they are the first team since the 2010 Jaguars to accomplish that feat. In last week’s victory over the Falcons, who have a score-a-minute offense in their own right, the Ravens held the ball for an astounding 39 minutes, 39 seconds. They did so by piling up 25 first downs, half of those coming on the ground, and running 77 plays to just 45 for the Falcons. “When you’re on the field for 20 percent less than what you normally have been, you’re obviously going to play better defense and play better as a team,” Ravens safety Eric Weddle said. The Chiefs are quite nearly the diametric opposite. Only four times in their first 12 games have they possessed the ball more than their opponents, and that was with reigning NFL rushing champ Kareem Hunt in the backfield for the first 11 of them. Hunt was released last week after a series of off-the-field issues became public. In fact, both of the Chiefs’ losses this season — at the Patriots and Rams — have come when they’ve lost the time of possession battle. It was particularly lopsided in New England, when the Chiefs had the ball for less than 24 minutes in what became a 43-40 shootout loss to Tom Brady and Co.
One of the big reasons for the disparity is that Kansas City simply scores fast, averaging an NFL-leading 37 points per game. The Chiefs’ quick-strike offense centers around Mahomes distributing to one of the deepest stables of skill-position talent in the league, headlined by speedsters Tyreek Hill and Sammy Watkins and their versatile, big-play tight end Travis Kelce. Mahomes has a league-leading 43 throws of at least 25 yards this season. Quite a few of those have been part of his NFL-best and franchise-record 41 touchdown tosses. Coach Andy Reid acknowledged that teams have tried to play ball-control offense against Kansas City, and for the most part it hasn’t worked that well. The Chiefs have been able to build big enough leads in most of their games that opponents have to abandon the run altogether. Notes: RB Charcandrick West has switched numbers after signing earlier this week. He wore No. 35 last year and was No. 30 at practice Thursday. … P Dustin Colquitt has been nominated by Kansas City for the Walter Payton Man of the Year Award. … TE Demetrius Harris (ill) missed Thursday’s practice.